Ever wondered which neighbor dog is leaving presents on your front lawn? Keeping an eye on the outside of your house is now easier than ever with wireless outdoor cameras. 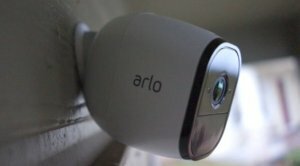 We have gotten our hands on a couple Arlo Pro’s to fully test them out. 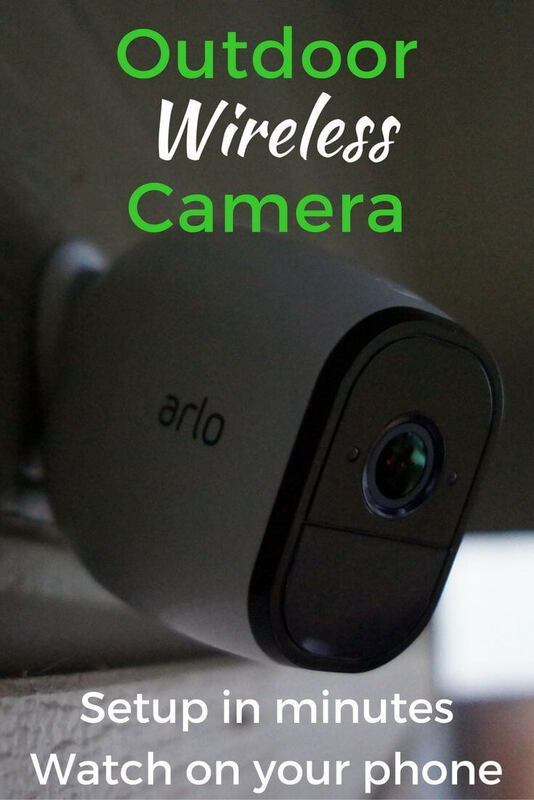 In this Arlo Pro review, we will go over our experience using them and show all the good and bad things about them. We will also try to answer questions about battery life, delays, and recording while the internet is down. Let’s jump in. 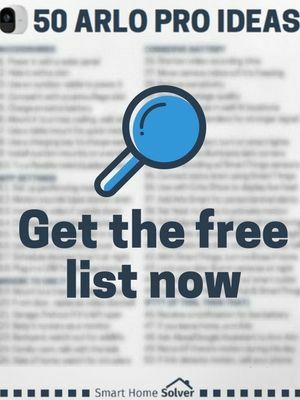 Disclaimer: The writers of this blog received a free sample of the product for review. They were not compensated in any other way. The opinions are 100% their own and not influenced. It takes no time at all to get the Arlo Pro outdoor setup and mounted outside. For this Arlo Pro review, we tried to see how fast we could do it and it only took about 15 min. This is pretty impressive to have a camera mounted and set up so quickly. When unboxing the Arlo Pro, you will find the camera, a rechargeable battery, a base station, a charger, and a wall mount with a screw. Connecting the camera to the base station was very simple. Plug the base station into the router with the provided ethernet cable and follow the instructions on your phone using the Arlo app. The Arlo rechargeable batteries came fully charged, which is nice. Activating the camera started triggering lots of alerts because it defaulted to Armed mode. So make sure to change the mode to disarmed right away. To mount the Arlo Pro to the wall you only need one screw. The wall mount slides on the screw very snugly and has a very powerful magnetic connection to the camera. You will probably find yourself attaching and removing them a few extra times just because magnets are fun. Arlo Pro has a great 130-degree field of view which was able to display more of our front porch and yard than we expected. We can also see almost our entire downstairs because it’s in the corner. Now we can see anyone that would come into our house and also more of our little toddler’s messes. The resolution is 720p, which isn’t the best, but not the worst either. You are still able to see people’s faces, but they won’t be crystal clear far away. There are probably a few reasons they went with 720 over 1080. Arlo offers awesome cloud storage for free, so not using 1080 resolution means more recording in the cloud. Also, the Arlo Pro rechargeable battery will use less energy transferring smaller amounts of data. In other words: longer battery life. 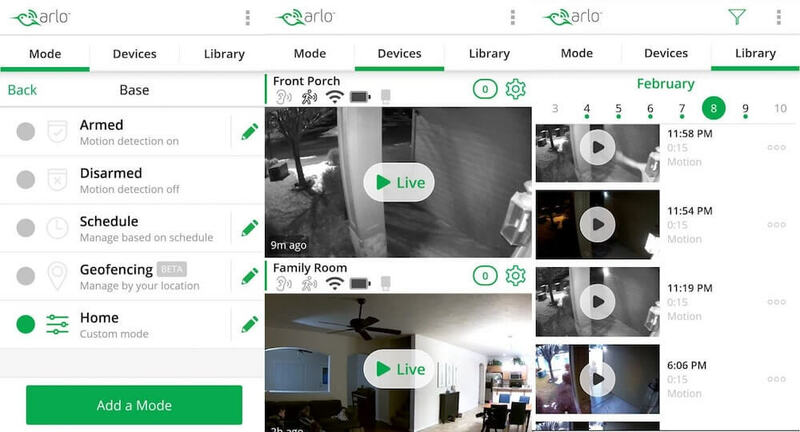 For the Arlo Pro review, we captured a lot of video recordings. In settings, we had the cameras record for 15 seconds. The majority of the time, the video recorded great. There were a few times where the video would pause for a second, but since these are wireless cameras it’s expected. The video always recorded for every motion detection and the quality was great overall. To download and view the video quality click here for the highest quality and click here for medium quality. Arlo Pro is equipped with sound, unlike the previous wireless Arlo cameras. Not only do they have microphones to detect and record sound, but they also have a small speaker for two-way voice. Now you don’t even have to get off your couch to yell at your neighbor’s dog on your lawn. The two-way voice is loud enough to hear it up close but it might be hard to hear far away. The microphone picks up sound pretty well. You can understand whoever is talking in a video clearly. 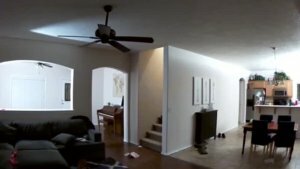 The Arlo Pro siren is surprisingly very loud. A high pitch shrill that made my ears ring a bit and I was even standing in the next room. The siren is only on the base station, but you can still yell at a stranger on your property with the two-way voice. There are some good and bad things with the alerts. First, the speed of getting alerts is very quick. Every time someone walks up to my door, I have an alert before they can knock. Opening the app from the alert goes to the Devices section where a notification number shows which camera has activity. It would be nice if the recorded video popped up right away, but it’s no dealbreaker. At first, I was getting a lot of alerts from cars driving by. The sensitivity was set to 80%. Once I turned it down to 60% then the majority of alerts triggered when people were walking near the camera. 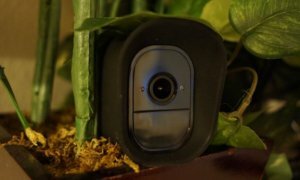 Detection zones are not available, which was surprising, but it is an upgrade available on the Arlo Pro 2 (compare the cameras here). Even much cheaper security cameras have this feature available. This would be nice to have because we do get alerts occasionally from the mail truck. Arlo’s answer for this is to make sure your security cameras are pointing downward, with a calm background since passing cars can set it off, but I like including the road in the background to see the full picture. The only Arlo Pro delay is the live video feed. When viewing the feed, there is a constant 3-second delay. So whatever is happening in the live video has actually happened 3 seconds ago. I can’t really think of how a slight delay would cause any problems, though. Overall, any Arlo Pro delays that have been reported in the past have already been fixed with updates. It’s very intuitive to use the app. There are three main sections: Mode, Devices, and Library. In the Mode section, you can arm or disarm Arlo devices and create custom modes, like arming the outdoor cameras and disarming the indoor ones. Each mode can be fine-tuned to fit exactly what you want. Customize the siren, sound or motion alerts, recorded video length, and the type of alert (email or push notification). One little quirk that could be better is allowing geofence and scheduled modes at the same time. I would like to arm all my cameras on a nightly schedule but have them also using geofencing during the day. The Devices section is where you can see the live video feed and the status of the cameras. You can view multiple live videos at once and see how much battery is left in each camera. Invert the image if it is hanging upside down or adjust video quality. All video recordings are in the Library section and they are downloadable for free. The rechargeable batteries can last up to 6 months on a single charge. This obviously depends on many factors such as temperature, how often the Arlo Pros are recording, and the video quality. The included charger cable can charge the batteries while they are in the camera. Going from empty to fully charged takes about 2 and half hours. There is an Arlo Pro charging station that can charge any extra batteries so the cameras always stay online. The Arlo Pro battery life checks out, even with pretty cold temperatures outside like we did in our Arlo Pro review. The Arlo Pro is a very sleek device that doesn’t draw a lot of attention to itself. Hiding it in a plant or a tree is very easy because it’s wireless and you can put it anywhere you want. The image below is a skin that can protect it outdoors or help hide it. 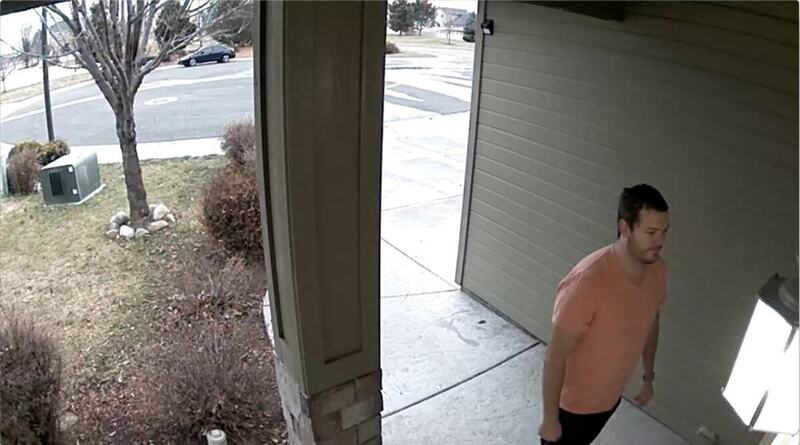 The Arlo Pro is pretty small so it won’t look like a sore eye on the front of your house. Setting up the local storage is very easy. Plug in a USB flash drive or hard drive into the base. Open the app and click Settings, then Base Device, and Local Storage. Here you can format the USB device to FAT32 and configure it to overwrite old videos if you want. You can’t view the local storage videos using the app, but you can by plugging it into your computer. You can also get alerts when the device is getting full. Local storage will still record video if the internet is down as long as the base has power. 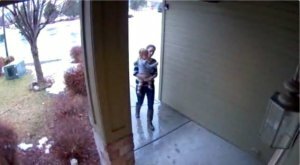 Arlo Pro makes is very easy to setup and have outdoor security cameras. The cameras are very high quality and the software is unrestrictive. The free cloud storage is more than enough and that includes all the premium features. This is not the case with other outdoor camera competitors. Although the Arlo Pro isn’t perfect, it still does a lot of stuff right. If there is anything we missed in this Arlo Pro review, please let us know in the comments below. Great review. I have been looking at wireless systems to replace an outdated CCT set up at my house. 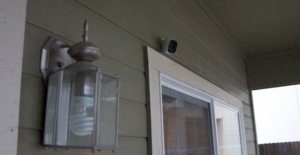 I have been trying to decide between the Arlo Pro and the Blink system which is shipping a new outdoor camera. 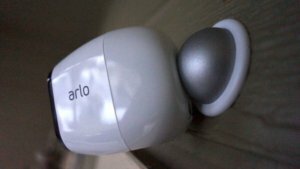 The Arlo Pro seems to possibly be in another class compared to the Blink system but the simplicity, price for features, and positive reviews of the Blink system appeals to me. Do you have any thoughts on the differences between these systems? Thanks. Thanks for reading. The Blink system looks like a pretty decent camera. A couple of differences stand out and that is the cloud storage and two-way voice. Blink offers 2 hours of cloud storage compared to the Arlo Pro which offers 7 days. Now usually these clips are 10 to 20 seconds so that might span the course of a week but there is that chance that you could accidentally overwrite important video if something kept triggering the motion detection. Blink can record audio but doesn’t have a speaker to talk to the other person. 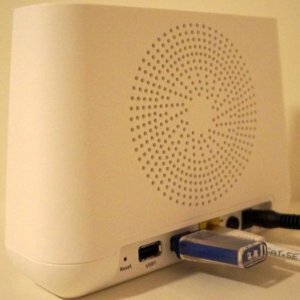 There are a few other things that Blink seems to be working on, like recording if the internet is down, which Arlo Pro already has. What about the outdoor charging cable? When will that hit the streets?